I read this article and found it very interesting, thought it might be something for you. 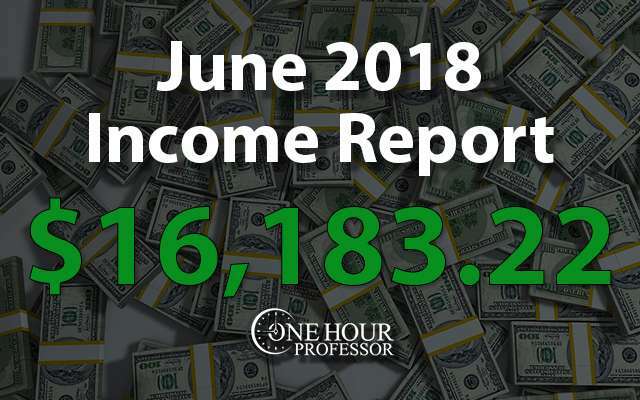 The article is called June 2018 Monthly Income Report and is located at http://www.onehourprofessor.com/june-2018-monthly-income-report/. This month went above and beyond my expectations. Not only was I able to have the best month ever for my online business, but I was also able to surpass my 2018 goal of making $15,000 per month in business revenue. In fact, I was actually able to generate over $15,000 this month in income after expenses and almost hit $20,000 in revenue. Needless to say, I’m very surprised by this myself and, on a personal level, it’s beginning to feel weird sharing these numbers. I feel like when I was under $10,000 per month it was no problem, but now that I’m starting to make some real money it feels a little awkward to talk about. That said, I’m trying to remember that the purpose of this report has never been to brag but to document my journey. I do intend on continuing to post these reports even though they are getting a little bit uncomfortable to show to people. In the month of June, I was able to make an average of $539.44 per day after expenses. The JFFH website had a significant boost in income due to a new job board partner that I established a relationship with. The JFTHQ website also had a significant boost in income. This was from a new partnership that we have established and additional income from Google AdSense. The CK website had a small boost in income but it looks like this could be a continuing trend in July. On a personal level, this month was really cool. My wife and I were able to visit Machu Picchu which is something that’s been on my bucket list for years. I think the really cool part about this is that we were there for two weeks of the month and I was still able to have the best month I’ve ever had in my business. Needless to say, I didn’t do too much work in those two weeks but the income continued to generate. Then again, these are passive income businesses so I guess that’s what the dream is all about. Last month I promised that I’d include a few pictures for you, and you can see them below. In the month of July, we don’t have too much planned in terms of traveling. My wife will be visiting me on July 9 and as of right now the only thing that we have planned is a short weekend trip to New York. This is somewhere that I’ve never been before and she has a few friends there, so we’re hoping that will be able to cut down on costs. Now you may be wondering why costs would matter considering I’m making more money in my business I ever have, and the answer is that we’re trying to save for a down payment on a house. I’m not exactly sure when my wife will have her green card approved to move to the United States for good, but when that time happens we want to have a hefty down payment so that we can move right into a house. For those of you that are tired of hearing me report that I’m making over $10,000 per month and wondering why it can’t happen to you, I highly recommend that you take my free course that explains how to start an authority website. Again, it’s 100% free and delivered through email, so you have absolutely nothing to lose by doing so. 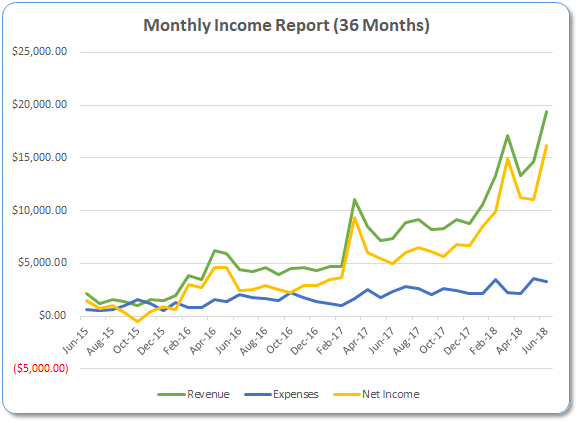 Before I dive too deeply the income report, if this is your first time on my website let me explain why I write a detailed income report each month that outlines the money I made (or lost) each month. Every month I have income that streams in from multiple sources and quite frankly, a lot of that is pretty regular. However, each month I tend to see a few line items that are drastically different from the prior month. In this section, I only discuss the items that have increased or decreased significantly. JFFH Partners: As I mentioned in the introduction, I was able to increase the income from JFFH partners significantly and this is due to the fact that I was kicked off of the Indeed.com API to show their jobs on my website. While this was incredibly frustrating at the time because my website was broken for about two weeks, I searched high and low to find a better job search partner and I was obviously successful in doing so. That said, I never expected them to generate this much more income every single month and this probably means that I’ve left at least $20,000 -$30,000 on the table over the last year or so. While it sickens me to think about, there’s nothing I can do about it now so I’m just going to enjoy the additional income that this revenue stream is bringing in. 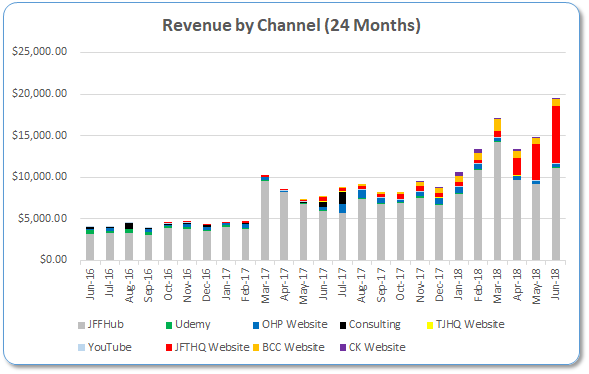 JFTHQ Overall Revenue: While this website has really continued to grow over the last month, I still think that there’s a long way to go. I was able to establish a partnership that is turning out to be very lucrative for me, but I also have found a way to make pretty good money from Google AdSense with this website as well. Similar to the income I make every month, there are certain expenses that I consider “fixed”. As I did in the income area, I’m only going to discuss the outliers or new items added as expenses. Freelance Research and Labor: While my expenses actually dropped a little bit this month, a lot of that is due to the fact that I had less website development work to do in the month of June. That said, there’s going to be more research needed in the month of July so we’ll see where we end up. JFFH Update: What a month it was for JFFH. In the month of June, I was able to increase my revenue by roughly 18% without incurring any additional costs. This is all because of the new job search partner that I have and while I’m not going to disclose who the partner is, I can say without a doubt that it’s a very lucrative situation for myself and for them. The way that their contract works is they give me 70% of earnings and they get 30% of earnings. While it may sound like a lot, the alternative to this is that I make no extra money at all and don’t even have a search partner to show jobs for me. Obviously, that isn’t going to work, so it looks like this partnership is going to be in place for a long time. My only problem with his partner is sometimes the relevancy of the jobs isn’t as good as I’d like, but they do have my feedback and have agreed to begin working on this to try to make it a little bit better. We’ll see what the future holds. Aside from that, this website is still the ultimate form of passive income. I’ve outsourced even more of the work so really at this point all I do is answer 10-20 emails a month and make the money that I do. It’s crazy to even think about to be honest. I’d say in a given month I don’t do more than three hours of work for this website, obviously it’s a good place to be. Consulting Update: I’m actually done consulting at this point. I no longer need this revenue stream and the only way I’ll do it is if somebody came to me with a very strong offer for my time. Udemy Update: It was Cool to see I was able to generate just over $50 this month from Udemy. That said, it really doesn’t matter anymore and I have no intention of creating another course here. OHP Website Update: Very little has changed in regards to the OHP website. I’m still waiting on my partner to take care of some personal things, but it looks like in the month of September she should be wrapping them up which means hopefully the podcast will be soon to follow. Obviously, I’ll let all of you know when this happens so that you can tune in. This month was a new record for this website and I’m hoping that this trend continues month after month. I really don’t see a ceiling on this website at this point and I’m working really hard to get additional backlinks to boost the rankings as much as possible. While it’s definitely going to take quite a few more months to get it where I needed to be, if I can get this website where I want then who knows how much revenue it will generate. My guess is that it’ll definitely surpass the JFFH website, but I’m not sure how much further it can go. The referring domains dropped a little bit, but this is data given directly by Google and quite frankly I thought that last month was exaggerated anyway. It was good to see that the page views jumped by about 10,000 for the month and hopefully this is the new norm in terms of traffic for the website. Earnings increased by just about 38% and that was mainly attributed to the new partner that I had established with this website. While I’m not comfortable with disclosing exactly who that is, it’s turned out to be very lucrative and I anticipate this trend will continue in the coming months. Aside from generating a few new backlinks, I basically did nothing for this website in the month of June. The additional income that you see just came organically and I can’t necessarily attribute it to any of the efforts that I’ve made. I’ve taken the time to ask my following from this website what types of products they think I should create. I’m definitely getting some good feedback and this could be a good Segway into creating a new Amazon product that could sell year-round. However, I’m a little hesitant to start this because I have quite a few other things on my plate. We’ll see what ends up happening here. There was a small increase in traffic for the month and the amount of referring domains went up quite a bit. The way I’ve set this website up is that the link building is a pretty passive process and it seems to be working pretty well. While I’m not surprised by the referring domains increasing, I don’t anticipate much growth beyond what you already see. CK Website Update: While this website is still having some issues, I’m happy to report that there was a positive trend in the month of June and with my current strategy, I hope that will continue. All that I’ve really done for the last few months here is let my writers and editor publish articles every week while I focus on link building. I’m about to put the link building into high gear with a campaign I’m going to run focused on an infographic, but I’ve never done this type of campaign before so we’ll have to see how it goes. From the research that I’ve done it looks like the infographic campaign could be a home run and I’m hoping that with this campaign I can really drive enough links to push this website over the edge and into a very positive place with organic traffic. As of right now, I’m hoping to hit 1000 referring domains for this website and it’s hard to imagine that if I was able to do that the website wouldn’t become very lucrative. Referring domains continued to grow in the month of June and I’m hopeful that this trend will continue in July. I’m not 100% sure if I’ll be able to launch my new infographic campaign, but I’m definitely going to try my best and if I’m able to do that effectively, it could be a huge moment for the website. Earnings increased a little bit on the website this month and that’s because I’m very strategically placing ads on pages that are already getting a lot of traffic. In the month of June, my virtual assistant finished pulling all of the ads off of the website and now I’m very carefully putting them back on in hopes that I won’t negatively impact traffic but can still make a little bit of money. Admittedly I lost a little bit of excitement for this website in the last two months when it started to go downhill, but this month I took some time to look back at the keywords that I could potentially rank for and my excitement is back for this project. While it’s going to take some time to make everything happen, this website could be very lucrative once all the pieces are in place. Problems Can Become Blessings: The biggest problem I dealt with in the last month was when Indeed.com booted me off of their publisher program and wouldn’t let me back on. This was a pretty difficult time and something I was incredibly frustrated by. I really didn’t know where to turn and applied with numerous publishers to try to get something that could fill that void. I was able to land on my new partner and due to this saw a huge boost in revenue from it. The point is, as long as you don’t give up when negative things happen, you should be able to survive and sometimes those big negatives can become huge positives. Ads Can Hurt Rankings: I’m going to straight up say that this is me speculating, but I definitely think that there is a correlation between SEO rankings and ads on your website. If you’ll recall, the CK website used to make around $200 per month in ad revenue but the traffic continued to fall. In an effort to stop this, I pulled all ads off the website except for about 10 pages and sure enough the rankings are starting to climb again. I don’t know if the ads themselves were hurting Google rankings, or if it was the fact that people weren’t staying on my page as long because they saw and clicked the ads, but regardless I think that this is some solid proof that ads can definitively hurt your SEO rankings. That being said, I don’t think that this is a reason to pull ads off of your website altogether. The way I see it, the CK website was very young when I loaded it with a bunch of ads and my guess is that Google saw this and didn’t really like what was happening. I’m hoping that in the future this website will continue to grow in traffic and I can slowly throw ads back on to make decent amounts of money. Think Through Your Website Monetization Fully: I was pretty lazy about my publishing partner for jobs on the JFFH website and that cost me dearly. My takeaway here is that if you have a website and think that you’ve monetized it to its full extent, take a step back and really think about that statement. Had I of monetized the JFFH website earlier with this partner, it’s likely that I’d have at least $30,000 more in my bank account. Don’t make that mistake, think through your website monetization fully before starting anything new. Did I Meet my Goals for June? I wasn’t able to get a full 10 deep backlinks to my portfolio in the month of June, but I was able to hit seven deep backlinks which is pretty darn close. I did this almost exclusively through guest blog posting and while it’s a laborious task, it’s starting to show its dividends. I intend on continuing this process in the month of July to continue to drive more deep backlinks to my website. I have begun the new outreach for the CK database and it’s already proven to be successful. While I think I’ve only gotten about three backlinks from it, three is better than zero and there are thousands of listings to go here and it will end up helping my website significantly in the future. I’ve fully planned my infographic campaign and have a researcher creating a list of targets for it. While it’s going to take some time to fully build out that list, the beginning of this campaign is already in action. What Are my Goals for July? By the end of the month I want to launch the Infographic link building campaign associated with the CK website. I already have someone researching potential targets for this, so now I have to create the article/infographic and start the outreach itself. I think this will be possible in July, it seems like a reasonable amount of work to accomplish. As of now I’ve gotten 7 backlinks to a specific page on the JFTHQ website to try to rank it and not much has happened, so in this month I’m going to shoot to get 10 more to that page. This is mostly through guest blogging and I’m working to figure out how to further outsource this process. Considering I am running a link building campaign around a database I’ve created for this website and email outreach is already booked for the rest of the month, I think I’ll be able to achieve this goal. Not 100% sure of course, but I am hopeful.